Prepare your wardrobe for spring with our collection of Beautiful Crochet Shawls. Among these ideas you may find your next project. Some of these shawls are beginner-friendly, so be sure to take a look at all of the options. You can use many different yarns for this project. Some of the best looking are ombre or multicolour yarns, which you can see used below. Colour is just flowing from side to side. These beautiful shawls can cover your arms during long day at the beach, or you can wrap them around your neck to protect yourself from cold evening breeze. Be sure to explore all the possibilities! Links to free patterns are under the pictures. This amazing shawl has beautiful border and features great openwork. For more free designs every day follow us on Facebook. Share your ideas and your work on our Facebook group! 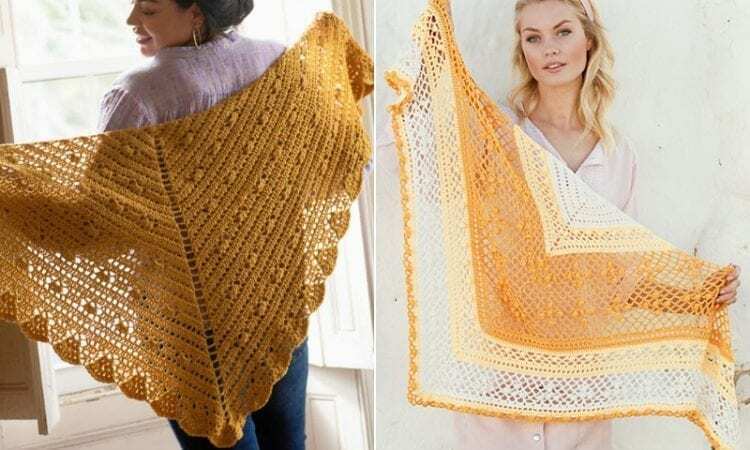 Basic stitches are enough to create this stunning shawl. For more free designs every day follow us on Facebook. Share your ideas and your work on our Facebook group! Bring some boho vibes to your summer wardrobe with this cheerful design. For more free designs every day follow us on Facebook. Share your ideas and your work on our Facebook group! This project is easy to make and has amazing colours. For more free designs every day follow us on Facebook. Share your ideas and your work on our Facebook group! If you want to be the center of attention, be sure to make this hot pink shawl! For more free designs every day follow us on Facebook. Share your ideas and your work on our Facebook group!